The Albion College student body is a diverse one and can be shown through laptop stickers. Some people can read a person by their body language and tone, but a laptop sticker can also show a lot about a person. Three hot spots for laptops were chosen for article interviews: the library, the Kellogg Center’s fourth floor and the science complex. Each unique sticker is accompanied by a direct quote from the student. Love — I love Michigan, and it’s a way to show my love for it. Veggie Queen — I love veggies, and kids at my school would call me the veggie queen, among other queen names. “H” pattern — It’s a brand that makes blender bombs made out of flax seed, dates and cacao powder that makes your smoothie better and filling. Run Mich — I love running. I got it from an indoor track meet called the Gazelle Elite that someone asked me to run in. Whale — I got this sticker from Vineyard Vines. I ordered something online and [the store] sent the tie-dye[-styled] sticker, and I liked it very much, [so] I transferred it from my old laptop to my new laptop. Capitalism — I got it at Briton Bash from the Albion College Republicans, and I thought it was funny because it’s true. San Diego — I shopped at the San Diego Surf Company store and bought it. It reminds me about my cousins who flew me into San Diego to spend time with them after graduation. “You Are My Sunshine” — My mom would always sing this song to me when I would have a bad day. No bad days — Whenever I would have a bad day, I would remind myself that someone else is having a worse day than me. “Cars” — It’s my favorite Disney movie. I like how it has a happy ending, and the cars are cute. My favorite character is Lightning McQueen. AXA — AXA stands for Anguilla. I got it because it’s my favorite vacation spot I went to, and it reminds me about my family. Piñata — I got it from Briton Bash at the [Organization for Latinx Awareness] table. I have memories about birthday parties and the piñata reminds me of them. Mangonada and chicharones — I was really hungry, and I missed the food from Texas, and all the local restaurants would have them. They are my favorite Mexican snacks. Shark — It’s a funny image, and doing homework is brutal, and when I look at the shark, it makes me laugh. Bee — I hate the “Bee Movie” with a strong passion, but I bought it because I read it in a funny accent. 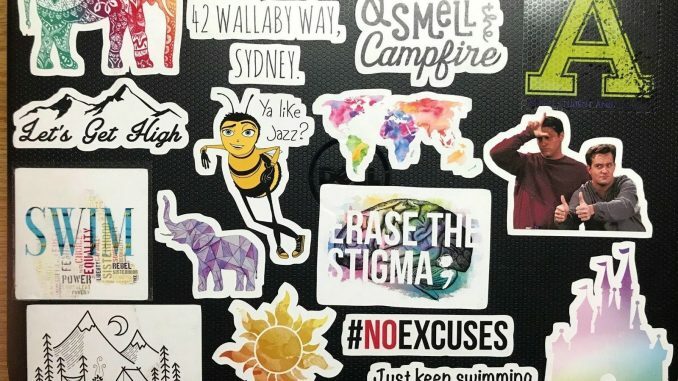 Erase the Stigma — I am a psych major, and I liked it. The semicolon is a symbol for the mental health movement. It symbolizes not to judge people based on their mental health. Be kind to people. Erase the stigma with depression and anxiety. “Friends” — I love the show “Friends,” and [the sticker] was free. Chandler and Joey’s bromance makes me happy. Campfire — Every summer, we would go to a camping trip with my extended family, and I love the smell of the campfire smoke. The smell is a natural outdoorsy scent: strong and subtle. Irene is a first-year student and a prideful Georgia Peach from Atlanta. Adjusting to a new environment, Irene seeks for new adventures and perspectives, so if you see her around, don't be afraid to say hi! She is a biochemistry major with a concentration in neuroscience with the aspiration to become a medical researcher and neurosurgeon. But most importantly, she is driven by changing the world one person at a time. She is a strong believer that people aren't projects but humans.